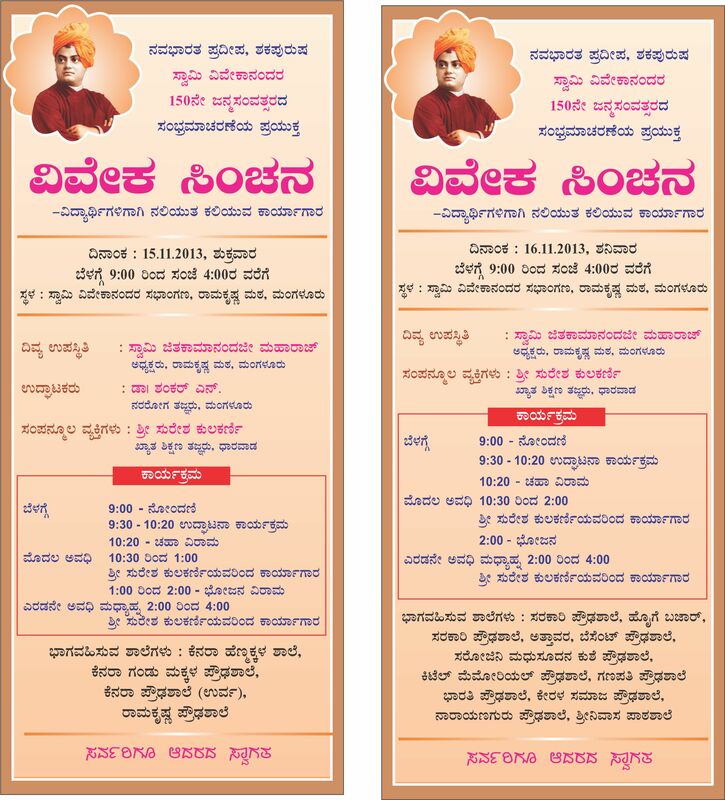 Swami Vivekananda 150th birth anniversary celebrations | Ramakrishna Math & Mission, Mangaluru. On January 14th Makara Sankranti festival began with Udayalapa of Dattatreya Velankar, Bangalore, disciple of Pt. Vinayak Toravi. He recited morning ragas Bilaskhani Todi, Bibhas and Alaiyya Bilawal. He was accompanied on Harmonium by Balnad Sriram Bhat, Mysore and on Tabla by Tonse Ranga Pai, Manipal. Pt. Dhananjay Daitankar’s, disciple of Pt. Shivakumar Sharma, Shata-tantri or Santoor concert followed in the Samay Sangeeta Yatra. His mastery over Santoor was well established in his performance of rag Parameshwari, a Carnatic rag which resembles rag Ahir Bhairav and rag Bageshree. He was ably accompanied on Tabla by Sameer Puntambekar, Pune. Noonday performance was given by Pt. Indudhar Nirodi, encyclopedia of music and senior artist. He is now involved in the mega project of recording all Vishnunarayan Bhatkhande’s works. Nuances of music were explored and introduced to the audience and students of music by him. He explained how Rag Bilawal with a light touch of rag Yaman creates a new rag Yamani Bilawal. Then sang the bandish in vilambit Tilwada taal and ‘Piya bin Kaise’ in dhrit Teen taal. Then Bandish ‘Pariye Payan’ was rendered in rag Jonpuri and ‘Aj sunao’ in rag Devgandhar. Guruprasad Hegde Giligundi, Sirsi on Harmonium and Gurumurty Vaidya on Tabla joined him. All the music lovers were served with festival lunch to savour along with the the music for the soul. Afternoon concert was given by Ravikiran Manipal, disciple of Pt. Madhav Bhat and Pt. Narayan Pandit. He selected Gandhar vaadi ragas Bhimpalas and Multani for Samay Sangeet Yaatra for his music presentation. Guruprasad Hegde on Harmonium and Shashikiran Manipal on Harmonium joined their hands. Sarangi-Sitar jugalbandi by Ustad Fayaz Khan and Ustad Rafiq Khan in the late afternoon was the star performance. They showed beautifully how jugalbandi expounds nuances and possibilities of a rag using different instruments. Being a singer Ustad Fayaz Khan also sang the Bandish ‘Kal nahi aye’. They were accompanied deftly in tabla by tabla maestro Gurumuty Vaidya. Two day music fest met its summit in the performance of Dr. Ashwini Bhide Deshpande of Jaipur-Atrauli gharana. Eloquent rendition of Sandhiprakashak rag Shree was followed by rag Durga, Janasammohini. Kabir bhajan in Bharavi marked the grand end to the fest. Vyasamurty Katti on Harmonium and Gurumurty Vaidya on Tabla accompanied her. On this occasion Narendra Nayak, Vice President, Sangeeta Bharati and Harmonium artist was honoured. Soulful music of the fest Panchamada Inchara-Viveka Smriti created a musical aura in the pious atmosphere of the Math. Swami Vivekananda himself was a great musician and musicologist, thus the Concluding Ceremony of 150th Birth Anniversary Celebrations of Swami Vivekananda was made more meaningful. On the occasion of concluding ceremony of 150th Birth Anniversary Celebrations of Swami Vivekananda “Panchamada Inchara – Viveka Smriti” – A two day Music Fest was organised by Ramakrishna Matha, Mangalore and Chirantana Charitable Trust, Surtkal jointly. Capt. Ganesh Karnik, MLC inaugurated the Music Fest on 13-1-2014 Monday evening. Swami Jitakamanandaji, President, Ramakrishna Math, Mangalore and Sri Abraham Kurian, DGM, Corporation Bank were present on the occasion. USTAD FAYAZ KHAN,a well known Sarangi player and singer rendered his performance on the evening of the first day of the Fest. He confessed, “I don’t sing just Dasavani. I am a Hindustani Classical singer. Hence the songs will carry a tinge of classical touch. More over I don’t sing the compositions of the famous singers.” He started his bhajan singing with ‘Modalondipe Ninage Gananatha’. Without delving much into the intricacies of Alaap and giving just a cherishing flavour of classical music he sang his own compositions ‘Ellinda Bande, Mundetta Payana’ written by Kanakadasa with a touching effect on the audience. ‘Enta Saviyo Ninna Kolalu’, ‘Na Ninna Dhyanadoliralu’ and other compositions written by Purandaradasa also won the applause of the audience. Sri Gurumurthy Vaidya on Tabla, Sri Shivakumar Mahant on Harmonium, Sri Nagaraj Shet on Taala and Sri Satish Kamath on Tanpura accompanied the artist ably. 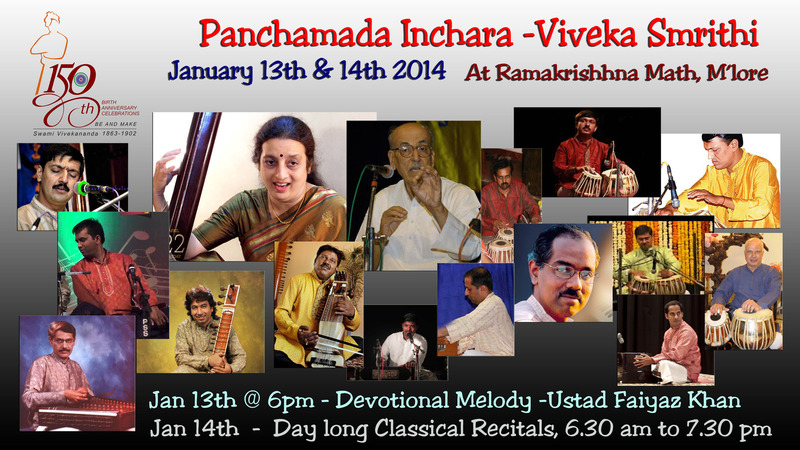 Panchamada Inchara – Viveka Smriti : Music Fest at Ramakrishna Math, Mangalore on 13th & 14th January 2014, on the ocassion of 150th Birth Anniversary Celebrations of Swami Vivekananda. There were grand functions all over the district welcoming Swami Vivekananda Ratha. People of Mangalore came in thousands to attend in the processions and programmes on 5-11-2013 Tuesday. 8.30am : ‘Viveka Patha’ – Students’ Procession Started from Mangalore Muncipal Corporation, Main Office Building. Sri J R Lobo, MLA, Mangalore, and Sri Shanadi Ajit Hegde flagged off the even. More than 4,000 students participated in the Procession. 11.30am – 12.30pm : ‘Viveka Vijaya’ – Youth Orientation programme was organised. Prof M B Puranik, President, Sharada Group of Education Institutions, Mangalore. Swami Jitakamanandaji, Swami Tyageeshwaranandaji, Sri J R Lobo, Dr. Jeevaraj Sorake, MD, SCS Hospital, Mangalore addressed the Youth. Around 600 students participated in the programme and took lunch. 4.30pm : ‘Viveka Patha’ – Public Procession started from Nehru Ground. It was flagged of by Sri Janardana Pujari, Ex Finance Minister for State, Govt of India. Around 1000 people joined in the procession. 6.00pm – 7.30pm : ‘Viveka Vijaya’ – programme for the public was organised. Father John Fernandes inaugurated the function. Swami Jitakamanandaji, Swami Tyageeshwaranandaji, Maulana Abdul Ajij Dharmi, Sri Janardana Pujari, Sri J R Lobo, Capt Ganesh Karnik were the dignitaries on the dais. Swami Vivekananda’s influence on the civilization and culture of India and the rest of the world is becoming clearer as days pass by. His thoughts are bound to affect the world positively more and more in the days to come. On this occasion of his 150th Birth Anniversary a Grand Ratha of Swami Vivekananda is being taken in procession all over the state. The Swami Vivekananda Ratha is entering Dakshina Kannada District on 1st November 2013. It will be in the district till 8th November. All are requested to attend the processiona, programmes and render your tribute the Indian Icon Swami Vivekananda & be benefitted by his messages. Viveka Kirana – Value Based Education for College Lecturers. The programme organised on 21-09-2013 Saturday was attended by College Lectures from different colleges of Dakshina Kannada District. In all around 1200 Lecturers and 2500 students participated in the programme series Viveka Samsmarana. Every student was given a complimentary book and a poster of Swami Vivekananda & every Lecturer was given with a set of books on value education and a poster of Swami Vivekananda. The programme organised on 20-09-2013 Friday was attended by high school teachers from different schools of Dakshina Kannada District. Viveka Shikshana – Workshop on Value Education for B.Ed. Students. The Programme on 19-09-2013 Thursday was attended by B.Ed. students from different colleges of Dakshina Kannada District. Viveka Jagruti – Workshop on Self Esteem Development for Pre-University Students (Girls). The programme organised on 18-09-2013 Wednesday was attended by students from different colleges of Dakshina Kannada District. Swami Vivekananda wanted each of us to be lions. In an attempt to manifest the lions within and to celebrate the 150th Birth Anniversary of Icon of India, Swami Vivekananda , our Ashrama is organising a series of programmes, “Viveka Samsmarana” – from 16th to 21st September 2013 at Vivekananda Auditorium, Ramakrishna Matha, Mangaladevi, Mangalore. Details of the programmes are given in the following pages. Entry to the programmes is through prior registration. For more details interested can contact the Ashrama. 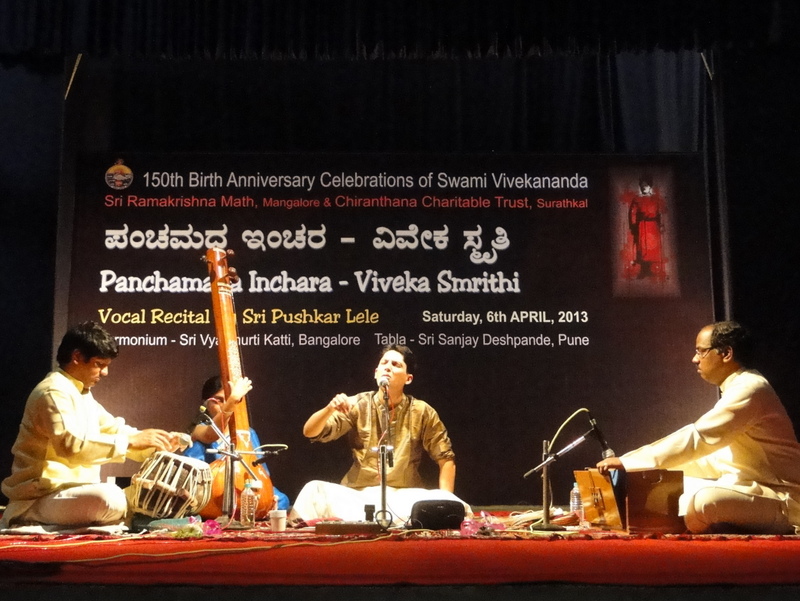 We had organised “Panchamada Inchara – Viveka Smriti” – Hindustani Vocal Music Programme on 6th April2013 as a part of 150th Birth Anniversary Celebrations of Swami Vivekananda in coordination with Chirantana Charitable Trust, Suratkal. Around 350 people attended the function.